Borussia Dortmund coach Jurgen Klopp has told supporters to "leave their negative thoughts at home" when the Germans host Real Madrid on Wednesday. Some fans have criticised the departure of Mario Gotze, who will join Bayern Munich in the summer for £31m. 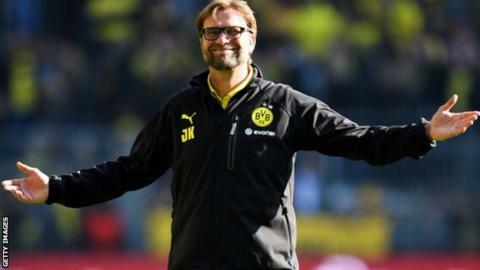 But Klopp, whose team play Real in the Champions League semi-finals, said fans need to show "Dortmund comes first". "This is too big for us to concern ourselves with any other issue. The Real game is too important," he said. Gotze, 20, will become the most expensive German player of all time when the midfielder joins Bundesliga champions Bayern on 1 July. Klopp, however, did not want the surprise transfer to dominate the agenda ahead of his team's first Champions League semi-final since 1998. "If anybody doesn't manage to realise how much effort has gone into getting us to where we are then maybe they should not bother turning up," he said. "If anybody cannot hide their disappointment then it would be nice if they would pass their tickets onto somebody who can. This team deserves to be supported. "I want to say once again: leave the negative thoughts at home, come here and give us everything you've got, and let us beat Real Madrid." Dortmund's opponents in that semi-final 15 years ago were Real Madrid, with the Spaniards winning 2-0 on aggregate before going on to win the title. But Klopp's team have had the better of Jose Mourinho's men this season, beating Real at home 2-1 in the group stages and coming away from the Bernabeu with a 1-1 draw. "That [the home win] was a fantastic game," said Dortmund midfielder Jakub Blaszczykowski. "We then went to Madrid and played one of our greatest ever performances. We have a lot of respect for Real, but we have already shown what quality we have in the team and we want to show it again."